Born Again? Who and How? What do the facts of science and the Bible reveal about dinosaurs about the earth before Adam? Why is evolutionary geology unable to account for the sudden extinction of dinosaurs? Here are the answers from the Geology Department of Ambassador College. DID you know that once literally MILLIONS of dinosaurs and other creatures suddenly perished from the face of the earth? Why? How did it happen? Why are scientists puzzled by this catastrophic time of great dying? Probably you never realized that most scientists are AFRAID to look into the Bible. If they did, they would be shocked. They would find it to be the key to reconstructing earth's history! The Bible answers all these questions. 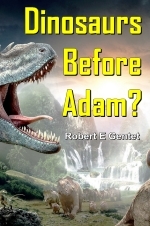 It reveals whether the earth is older than man just what kind of world God created in the beginning. But there has been a CONSPIRACY to hide the Biblical truths which answer these vital questions! Evolution has no answer to the SUDDEN disappearance of dinosaurs. No answers to the almost complete change of both plant and animal life forms at the end of what scientists have dubbed the "Mesozoic Era." Why is the present world fitted for man's existence, while the world of the dinosaurs was unfit for human survival? Here is the answer. Take a brief walk through any natural history museum. It will reveal a vast array of charts and fossils depicting the theory of organic evolution. Geology, you will be told, provides evidence of a succession of life forms in the strata of the earth. But does the record of the rocks really show this? Do the facts of science substantiate these "scientific" theories? Furthermore, it is claimed, the earth is billions of years old and the fossil record the aged bones, tracks, and other remains of extinct animals and plants proves that life has been evolving over millions of years. Nonsense! Why have scientists REBURIED the facts only to resurrect them in the image of their evolutionary theories? This article explains why. Life, according to these scientists, began in what they call the ancient "Cryptozoic Eon." Then, as it supposedly slowly developed into many different kinds of life, these "developing" plants and animals were buried in the rocks and became fossils. But do we find a record of "developing fossils" a record of "half-way developed" plants and animals in successive order? Actually, the divisions of the geologic time scale, which you will see in any museum do NOT really represent great elapses of time. They depict rather thick sedimentary layers which were deposited quickly to preserve fossils. But scientists say evolution is a very slow process. Therefore, the evolutionist, in order to prove his theory, creates different "eons," "eras," "periods," "epochs," and "ages" to allow what he considers sufficient time for evolution to occur. Great dinosaurs and giant lizards inhabited this planet before the creation of Man. This ancient world was unfit for human habitation. succession of life forms in successive eras. They show, instead, the relative order in which life died during TWO great world-wide destructions — both of which are mentioned in the Bible. The average Bible student does not correctly interpret the findings of geologic science, The vast array of charts, graphs, and long, detailed explanations of the scientists — based upon the fossil remains — seem to disprove what most so-called Christians have been taught about the Bible, And no wonder! For what most professing Christians have been taught about the Bible is wrong! It is time to look at the facts of science and see what they really do prove! You don't need to fear the facts of science, God's Word is truth (John 17:17), The Bible was not written as a science textbook, yet whenever it does speak on events which would affect the geological question, it stands true! Let us investigate the findings of science and see if they prove the theories of science or the teachings of The Holy Bible. We can use any modern geology text-book to investigate these theories and facts. You don't have to fear the facts of scientific research and discovery. Rather, use them as tools to make the Bible more meaningful. It is the evolutionist who is afraid of the Bible. "The Time of the Great Dying"
Notice this admission from the well-known geology book, Historical Geology, by Carl O. Dunbar, Here is what he says about the sudden extinction of dinosaurs. "The end of the Cretaceous, like the close of the Paleozoic, proved to be a great crisis in the history of life.. For example, the dinosaurs were highly varied and apparently adaptive right up to the end of Laramie Time, yet not one is known to have lived to see the dawn of the Cenozoic Era (the age of man).... The marine invertebrates did not escape the crisis. "It is difficult to account for the simultaneous extinction of great tribes of animals so diverse in relationships and in habitats of life... Whatever the cause, the latest Mesozoic was a time of trial when many of the hosts were 'tried in the balance and found wanting' — wanting in adaptiveness to their new environment. Walther has picturesquely called it 'the time of the great dying'" (Historical Geology, pages 345, 348, emphasis ours throughout the article). Naturally, this evolutionist has couched the time of trial and "great dying" in evolutionary language. But the fact remains that great tribes of animals suddenly disappear from the geological record in the Mesozoic rocks without any gradual extinction as the theory of evolution would require. The dinosaurs are an outstanding example of this. Entire books have been written attempting to put forth reasons for the sudden extinction of the dinosaurs. Notice this amazing admission: "At the present time we can therefore only look upon the problem of extinction of the dinosaurs as a hard fact, as a closing of a most spectacular chapter in the history of life on the earth" (Dinosaurs, Colbert, page 259). The "hard fact" and "problem" of the extinction of the dinosaurs as well as many other forms of life during the time Mesozoic rocks were deposited is indeed a problem for the theory of evolution. For, the theory does not allow for any sudden appearance or disappearance of life forms! Yet, the facts of science show this very thing has happened. The FACTS of historical geology do not agree with the theories of evolutionary geology! These giant creatures, which once inhabited the earth, all suddenly perished in a terrible catastrophe that overwhelmed the world before the creation of man. Their sudden disappearance presents an unsolvable problem for evolutionists. "G. G. Simpson he has said, that most dramatic and in many respects the most puzzling event in the history of life on the earth,... is the change from the Mesozok Age of Reptiles, to the... Age of Mammals. It is as if the curtain were rung down SUDDENLY on a stage where all the leading roles were taken by reptiles, especially dinosaurs, in great numbers and bewildering variety, and rose again IMMEDIATELY to reveal the same setting but an entirely new cast, a cast in which the dinosaurs do not appear at all, other reptiles are mere supernumeraries and the leading parts are all played by mammals...'" (page 426). And on page 404 he states further: "Throughout the long Mesozoic Era — for more than a hundred million years — reptiles completely dominated life on the Earth; but at its close their dynasty SUDDENLY collapsed. Turtles, lizards, snakes, and crocodiles survived, but they are mostly small and restricted in their range, and few are aggressive." Yes the curtain was rung down on the reptilian host and — suddenly! The reptiles alive today on the earth are no comparison to the vast and impressive numbers of these awesome creatures that once completely dominated the earth! This Mesozoic "Era" was the ringing down of the curtain in earthshaking destruction of this impressive host of reptiles. It was not an era in which animals lived and multiplied but a short, violent catastrophe. Not only do we find that the facts of science show a sudden disappearance and appearance of certain life forms, but also the rocks reveal the earth itself has had radical change in its history. For example, the modern appearance of the surface of the earth would have been unknown in the Mesozoic Era: "Every feature of the modern landscape was shaped during the last short era of geologic time. The Alps and the Himalayas have come up from the sea floor; the Rocky Mountains have been worn down and then uplifted to their present height; the Appalachian Ridges have been etched into relief; and the other mountain ranges of the world have been elevated and sculptured to their present forms since the beginning of the Cenozoic Era. The streams also have attained the courses they now follow, and climatic zones have assumed their modern character.... This era (the Cenozoic Era) saw the modern world unfold!" (Historical Geology, page 352). Here again, we must distinguish between the facts of science and the theories of evolutionary science. The facts show the modern mountain ranges, climatic zones, animals, and plants are a feature of this geologic time since Adam — the Cenozoic "Era." However, evolutionary explanations of why or how these changes came about are only their theories. There is a great difference between the theories and the facts of science! The world before Adam was populated by giant dinosaurs and myriads of other unusual creatures. Here you see their bones, excavated from the soil which buried them in a terrible catastrophe that struck the planet earth before the creation of man. Skeletons may be viewed in Peabody Museum, New Haven, Connecticut. An artist's concept of what one variety of dinosaur might hove appeared like to man had he been on earth in the pre-Adamic world. (From Dinosaur Park, Rapid City, South Dakota.) The initials carved on the dinosaur represent a common tourist practice. infallible Word of God, you need to do this ahead of further geologic research. Read our FREE booklets "The Proof of the Bible," and "Does God Exist?" and "Seven Proofs God Exists" with these booklets. Once you have proved the Bible to be God's Word, you will have an absolute guide! Then, what about the scientists' claim that the earth is perhaps billions of years old, and that the fossil record in the rocks proves their theory of evolution? Is there any truth in either of these statements? Much unnecessary confusion has arisen among Bible students who do not understand that the earth was created long — perhaps even billions of years — before man. This is fully explained in our free article entitled "Did God Create a Devil?" If you do not have this article, write for it immediately. The Bible nowhere tells us when the earth was created. God does not tell us how long the earth had been in existence before He created man. However, Biblical chronology reveals that man has been on this earth for almost 6000 years. How can we use this knowledge to understand the record in the rocks? Using the facts of science, let us compare them with the teaching of the Bible. Let us begin with Genesis, chapter one. The six days of Creation are well known to any Bible student. These were six literal days of 24 hours' duration. For proof, read our free article entitled "How Long Were the Days of Creation?" Let us closely examine the Bible's account of events which occurred on these six days and see what they reveal. We will dwell on the animal and plant life mentioned in the account and note carefully the description of this new creation. On the third day God said: "Let the earth bring forth grass, the herb yielding seed, and the fruit tree yielding fruit after his kind, whose seed is in itself, upon the earth: and it was so" (Gen. 1:11). Now let us examine the geology books again and discover what the facts of science reveal. We will find a direct correlation between the revelation of the Bible and the findings in the rock layers! Notice this amazing admission: "One of the big problems of plant evolution, and especially of the evolution of flowering plants (fruit trees, etc. ), is the fact that the latter appears so suddenly in the geological record, As we pointed out earlier, they (the flowering plants) appear in a great variety and abundance in the late Cretaceous period. Darwin called their origin an 'abominable mystery' and most evolutionists today still agree. Stott says much the same, He points out that the fossil record of the flowering plants shows NO SIGNS of a beginning, for with few exceptions all the specimens can be referred to families still existing" (Genes, Genesis, and Evolution, Klotz, p. 453). Another scientist agrees: "Deciduous trees suddenly became conspicuous in the Early Cretaceous, and long before the close of the period dominated the landscape and all the continents, just as they do today" (Historical Geology, page 332). Most deciduous trees are true flowering plants. Genesis 1:11 would also include the grasses of the field, the fruit-bearing shrubs, vegetables, cereals, and the other seed- and fruit-bearing shrubs. Here then is direct geologic confirmation of the Scriptures! The plants described in Genesis 1:11 appear suddenly in the geologic record. No gradual evolution here! Is it only coincidence that all these plants suddenly appear in the geologic record? Of course not! There are many other coincidences when we compare the geological record with the Bible account of Creation in Genesis 1. The final day of Creation saw the addition of fish and birds to the earth (Gen. 1:20-23). All geology books assert that fish have been on this earth long before man existed. If this is true, then why are fish included in the Creation account in Genesis? Remember, the animals and plants, in general, as described in Genesis are those which are associated with man. The plain truth is that when geology books mention fish in the Paleozoic Era, they are not generally referring to the fish which today populate the waters of the earth, "Most of the modern families (of fish) and a few existing genera probably date from the Eocene (a subdivision of the modern era)" (General Zoology, Storer, page 610). This is further substantiated by the following admission from the book Creation By Evolution: "In the following Cretaceous seas there were a few fishes that had the bony support of the tail as well formed as that of most existing bony fishes; indeed the reign of the modern THIN-SCALED bony fishes, completely adapted for rapid movement in water, had begun, and the only subsequent changes were those which have given almost endless variety to this thoroughly efficient race" (page 131). Thus, those fish associated with dinosaurs did not have the thin scales of modern fish, but had hard, enamel-like plates. The modern fish which we have today appeared at the time of Adam, as Genesis records and geological findings validate. As we have already noticed in Genesis 1:20, the bird family was also created on the final day. However, this does not include the winged reptile — with wing claws, teeth, and long tail bone — which scientists named Archeopteryx. It was not until the modern era that the true birds appear: "Modern types of birds, all toothless, appeared before the close of the Cretaceous, and in the Eocene (a division of the Cenozoic — the era of man) most of the present orders were represented" (Historical Geology, page 435). Thus, modern true toothless birds definitely were not present before the "Cretaceous Period," which basically divides the world of the dinosaur from the world which existed after Adam's creation. Here again the findings of geology substantiate the teachings of the Bible! On the sixth day God created the "cattle and creeping thing (insects), and the beast of the earth after his kind" (Gen. 1:24). Modern classification of animals places the cattle and beasts in the class of Mammalia. Mammals, as we have seen previously, are so characteristic of the Cenozoic (modern) Era that it has been rightly called the "Age of Mammals." The curtain which rang down suddenly on the disappearance of the reptilian world just as the "Age of Mammals" — the creation described in Genesis 1:24-25! WHY the Sudden Change of Life Forms? The previously mentioned article, "Did God Create a Devil?" explains the time lapse which occurred between Genesis 1:1 and Genesis 1:2. The earth, as we have seen, was created at an indefinite time — perhaps millions or even billions of years ago, Man, however, has been on this earth only about 6000 years, as proven by Biblical chronology and supported by the historical records of many nations. Ezekiel 28 and Isaiah 14 tell of the time when the great archangel called Lucifer — who ruled the earth before Adam's creation — rebelled against his Creator and fought God's loyal angels for control of the universe. In his rebellion, he led away one third of the angelic world (Rev. 12:4). Jude 6 tells us of this very same time. Satan did not want to remain on the earth as the angelic servant of God — even though the whole earth was then as beautiful as the Garden of Eden — but he became jealous and tried to take away the authority of God (compare Isa. 14:13-14 and Jude 6). It was at this time that the archangel Lucifer became Satan! This great battle for the control of the universe caused great destruction upon the earth. Animal and plant life of the types that then lived were destroyed, rapidly buried, and fossilized. The earth BECAME chaotic and void (as Gen. 1:2 is more properly rendered). Life was taken from the earth so that when God rebuilt the surface of the earth and created man and the many new life forms described in Genesis 1, 2, God commanded man to replenish — or repopulate — the earth (Gen. 1:28). The word "replenish" literally means "to refill" and would not have been used if life had not been on the earth in an age before Adam! The same word is used in Genesis 9:1 after the flood in Noah's time had completely destroyed all animal life except that which survived in the ark. The earth had to once again be "replenished" at the time of Noah! Thus, this sin of the angels was therefore before the time of Adams creation. Remember it was very soon after Adams creation that Satan tempted Eve (Gen.3). Lucifer had already fallen! Remember also that it was on the first day of Creation — shortly before the creation of man — that the earth was without form and void (Gen. 1:2). The first six days recorded in Genesis 1 describe the surface of the earth being reformed out of a chaotic condition! Yet, Isaiah 45:18 plainly tells us that God did not create the world in this condition of a void wasteland! The earth became chaotic at the rebellion of Satan before the creation of man. The truth now becomes clear! The earth had been populated by various forms of plant and animal life before Adam. At the rebellion of Lucifer against the authority of God, the earth was thrown into chaos and a time of "great dying" and "time of trial" ensued. Many animals vanished from the earth at the end of Mesozok, never again to be found in the later rock strata. God did not give man a hostile reptilian world — filled with dinosaurs — to inhabit! Instead, He provided man with a special creation suited for man and his needs! Let us now more closely examine why many new forms of life appear in the Cenozoic Era with man. Genesis 1, 2 will again provide the key! Notice the importance to man of these plants and animals that were created with man. The following admission will quickly summarize the usefulness of the plants described in Genesis 1:11-12, which we have noted appeared the geologic record. "... They (the angiosperms, or our modern plants) supply nearly all the plant life for the mammals (which also, remember, appeared suddenly at this same time) that now dominate all other life upon the earth. Angiosperms provide the nuts and fruits of the field, the grasses of the prairies, the cereals which furnish fodder and grain for man and his domestic animals, and all the vegetables and fruits that MAN has cultivated, to say nothing of the flowers that add so much pleasure and inspiration to HUMAN surroundings" (Historical Geology, page 336). These plants did not inhabit Lucifer's world before man because Lucifer and the angels did not need them. God not only created man, but He created with and for man a world suitable for him. Man could not have survived on the earth before this time! The animals and plants man uses for food were not in existence in the pre-Adamic world. When God created man, He also created the necessary animals and plant life to sustain him! God is good and gracious Provider! In relation to sea life, notice his amazing admission from the book Creation By Evolution: "It is also interesting to note that the fishes which achieved these latest developments (thin scales) include nearly all those that are used as food by man today" (page 131) As we have seen previously, the modern thin-scaled fish — edible for man — appear in the Cretaceous rocks! Here again we see Scripture wholly backed up by the facts of science! Both the time elements of their appearance and their usefulness to mankind are again confirmation of God's Word! The same is true concerning the true birds which appear in the Cretaceous rocks. Birds are very useful to man for food — as in domestic birds — and for holding a check on insects, weed seeds, and rodents. The beauty and song of birds were especially designed to please man's senses. The flying reptiles of the pre-Adamic world would hardly appeal to man's tastes or compare to the modern birds in usefulness to man! The importance of mammals to man is immense — in the role of providers of food, clothing, and beasts of burden. The importance of mammals to man cannot be overemphasized! But the same could not be said of animals that existed with the dinosaur in Lucifer's pre-Adamic world. In summary, we have seen how the Bible does not tell us the earth's age, but does tell us man has been on the earth almost 6000 years. Before the age of man the earth was filled with animals and plants which characterized Lucifer and his host. The great dinosaurs and other forms of Lucifer's world were buried in vast fossil graveyards as a re-suit of Lucifer's rebellion. Later, just before God created man, the earth had to be remade into a livable habitation for man (Gen. 1, 2). God created the animals and plants necessary for man during the six days of Creation week. Fossils of these plants and animals are generally speaking, the result of Noah's flood or other events which have occurred in the past 6000 years. We have briefly seen how the two great divisions of life on this earths as recorded in the geological record coincide with the teaching of God's Word. There is no contradiction between the facts of science and God's inspired revelation to man! But, mankind has rejected God from his knowledge and wishes to substitute his own theories for the goodness of God (Rom. 1:18-22, 28). The beginning of true knowledge comes only from a fear of God (Prov. 1:7). Evolutionists without God's Word as a guidance ever learning, and never able to come to the knowledge of the truth (II Tim. 3:7). Evolutionary scientists will continue to devise and discard one theory after another, but the facts of science will always agree with God's Word! "Cenozoic Era" What geologists label the "Cenozoic Era" is, in reality, the Age of Man's existence on the earth. It is characterized by the abundance of animals and plants essential for HUMAN survival. Livestock and other mammals, and fish and fowl, which provide meat for Man, are found buried only in the strata of this "age." Fruits, vegetables and grains are characteristic only of this world and are entirely missing from the pre-Adamic or "Pre-Cenozoic" world. All edible food that is essential for Man suddenly appears in the age scientists have dubbed Cenozoic. Even the atmosphere, the climate, the seasons and the modern topography including the present limits of the ocean are characteristic only of the "Cenozoic Era." Our world, the so-called "Cenozoic," was refashioned from the shambles left after Lucifer's rebellion against God. Fossils found in so-called Cenozoic rocks are generally due to the rapid burial of life forms at the time of Noah's flood (Genesis 7 and 8). These "Cenozoic" or Flood deposits are found above other earlier strata laid down in a terrifying CATASTROPHE that befell the world before Man existed. The deposits of that earlier world end with the first "time of great dying." "Paleozoic" Eras Fossil remains from the pre-Adarnic world are found buried in a relative order — with the rocks on the bottom generally containing sea life — because the sea life was first destroyed and buried. Then, later, as the terrifying destruction of life enveloped the land, the dinosaurs and other land life forms were covered by heavy sediments from raging waters. These last deposits of the pre-Adamic world, the so-called Mesozoic Era, are termed "Early Cretaceous." The "Mesozoic" world the time before man's creation was — so characterized by dinosaurs and other reptiles that scientists have rightly called it the Age of Reptiles. Giant reptiles — some weighing probably up to 40 tons — not only roamed the land, but flew in the air, while yet others excelled the fishes in the sea! Gigantic insects filled the air. Giant tree ferns, horsetails, club mosses, cycads, and conifers covered the face of the earth, creating vast forests unlike any we know today. In that world were no true mammals, no fish with true scales, no feathered fowl, no grass, no grains or fruits for Man. Man was not then in existence. The so-called "Paleozoic" rocks layers containing SEA life therefore do NOT represent a separate time apart from the "Mesozoic." "Paleozoic" rocks merely contain the buried remains of sea life that was first to be destroyed consequent to Lucifer's rebellion. The characteristic fossils found in "Paleozoic" rocks are ammonites, trilobites, sea scorpions, sharks and other unedible fishes. Many were giant varieties. This was an entire world unfit for human habitation and enjoyment. All life was suddenly buried. Most life-forms were never re-created when God reformed the earth and made this world habitable for Man (Psalm 104:29-30).